The climb up to Oak Glen seemed harder than last year. Steeper. Much hotter with some good hot places. Even at 9:00 in the morning!! I was sweating up a storm for about 15 minutes -- sweat was pouring over my sweatband and into my eyes and glasses. I must be having Hot Flashes? This is Agony for sure. I am now paying my dues. Heart Rate Monitor blowing up. Front wheel lift off. I hate front wheel lift off. I can't read my Computer due to Sweat Overload -- it's probably best since it's probably like 5 MPH. I can't read my Heart Rate Monitor -- it's probably best because I'm sure it's 185 or more. Stay on the bike. Stay on the bike. "Scotty, can you give me more power from the Warp Drive Engines?" "Captain, I'm giving you all I can get. She's going to blow, Captain!!" 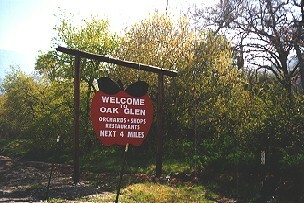 Now I remember: our family car even has a hard time motoring up this road when we come up to Oak Glen for Apples in October. The car's engine backfires. My engine is now backfiring. Ready to blow up. I was talking to the Grim Reaper at this point, unable to take photos. I came upon Shelly who was doing very well considering she's been struggling with knee problems. She cranked right up the steep section of the Oak Glen Climb as I was seeing Front Wheel Liftoff in numerous places and sweat pouring all over the place. I was glad to have my 39-27 for just awhile here. Shelly had only a 21 and pulled right away from me. I can't even imagine Robert smoking up this climb in his 21!! How is that humanly possible? It's certainly beyond me. And way beyond my knees. He, Shelly, and anyone else doing this climb in a 21 must have been born on another planet in another universe! 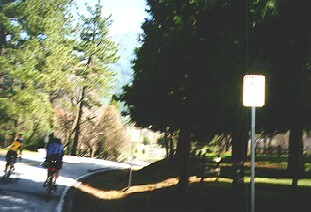 The Redlands Bicycle Classic climbs up this same Oak Glen climb in March of each year. The Pros race up the same road we are on today. Yet, someone said that even Alexi Grewal had to get off his bike and walk up the steepest part of this climb once. It was truly a Breathless Agony scene here. I couldn't take photos because I was having a hard time keeping my bike upright. Where's the top? Finally, I came up to the Museum. This is near the top. I thought of a huge crowd of 100,000 on the top of Alp D'Huez in the Tour de France. I thought of those lead guys separating the crowd just like Moses parting the Red Sea. I imagined there's this huge crowd screaming on the sidelines of the Oak Glen Climb. Not that I'm one of those lead guys ... but it helped fire me up. At the top of Oak Glen, I went for the Vest as soon as I could ... it was then freezing cold and it felt good. I reached for my camera and grabbed this action shot of Shelly and Jim Carter at the top of the Rollercoaster Lift Hill. I love Rollercoasters and the Oak Glen Descent is one of the best Rollercoaster rides in Southern California. Party Time!! Time to open up the throttle. It was a blast, carving my way around the switchbacks coming off of Oak Glen. Carve the switchbacks. Let 'er rip. Spin out in my 52-12. I thought to myself, cycling doesn't get much better than this. From the worst to the best in less than a mile -- this is so wild. 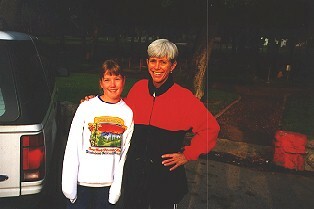 Barb Hill was at the Ranger Station Rest Stop. It was great to see her and her daughter Heather out supporting the ride. Barb has been there every year for us on this event and she is just a delight to work with and get to know!! Thanks Barb. Barb had lots of customers at the Beautiful Second Rest Stop. 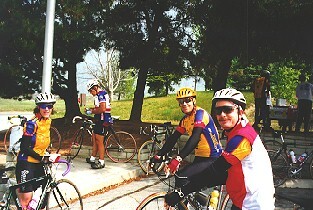 Here, Robert and Pete are ready to Rock and Roll up to Angelus Oaks then up to Onyx Summit. That fella in the distance is Paul Kopit, a Double Century specialist. Shelly is on the left after having a good ride on the Oak Glen Rollercoaster. Each of us had a major decision to make. Turn left and head back to Sylvan Park, thereby completing 2 Passes with 3,740 Feet of Climbing in the first 35 miles!! 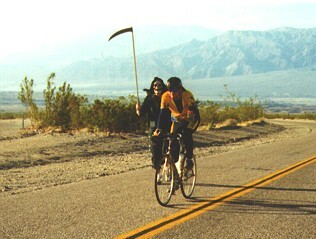 Or for those Brain Dead, turn right and climb up to Angelus Oaks then up and up and up above the clouds to Onyx Summit. Since all but 8 riders turned right, we now have scientific proof that this ride attracts the Brain Dead.